Supplementary material reads: "Bill Chernus. 1951-09-30. D-1: Shows two girls. Patricia Mullin standing beside diving suit at left and Nancy Stockinger, sitting on knee of 'diver' examining hand of suit. Diving gear is part of new 'Mariners' exhibit at Cabrillo Beach Marine Museum. D-11: shows Patricia Mullin at left, standing beside case atop of which is Island outrigger, and Nancy Stockinger is standing at right. 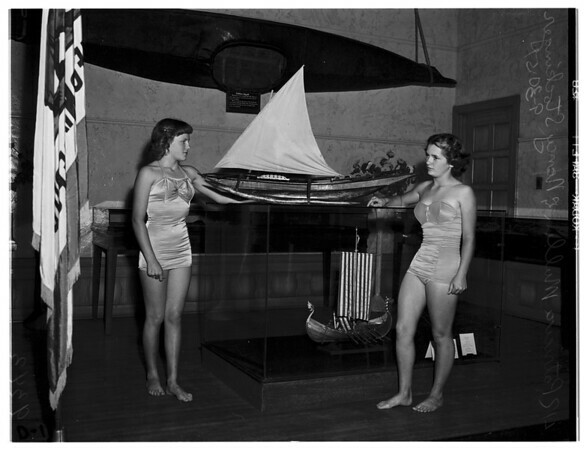 Outrigger is one of more than score of model boats on exhibit in the new 'mariners' exhibit at the Cabrillo Beach Marine Museum".